Billy Smith, CMS nominee; Debby Peery, GRTS nominee; and Dr. Roger Barnes, superintendent. The Chillicothe Education Foundation held its annual benefit dinner Wednesday evening, January 28, 2015, at the home of Ed Milbank, CEF Board Director. The foundation raised more than $20,000 at the benefit, which CEF President Ed Douglas said was record breaking. "It's been the most successful benefit we've had so far, and money is still coming in," Douglas said. For the past 17 years, the event has been held at the home of Milbank, who also provides food and beverages for the evening. Douglas said that the annual CEF-Milbank benefit is the only fundraising they need for the year unless they have a special project to save up for. He added that annually, approximately $11,000 is spent on the Teacher of the Year awards, roughly $1,500 on the Beacon awards, around $4,000 on teacher mini-grants and nearly $2,500 on teacher recruitment and retention. However, he said the amount they spend on teacher recruitment and retention varies. In addition to the Teacher of the Year awards, Beacon awards, mini-grants for classrooms, teacher recruitment and retention and student scholarships, the CEF has also taken on various special projects to benefit the district. "Our purpose is to do things that the school can't do itself," Douglas said. The CEF tries to assist the school district in many ways. For example, fundraising for the construction of the new Jerry Litton Memorial stadium was headed by the CEF, and the land the stadium sits on was also partly purchased by the CEF in 2003. The CEF bought 45.6 acres and the late Mr. and Mrs. CP Hutchinson donated 15.6 acres of that land. According to Douglas, the land was purchased with intentions of expansion. Attendees of Wednesday's benefit gathered prior to the evening meal to recognize this year's Chillicothe R-2 Teacher of the Year and Beacon Award (support staff) nominees and winners. Earlier this year, each school nominated one staff member for the Beacon Award. 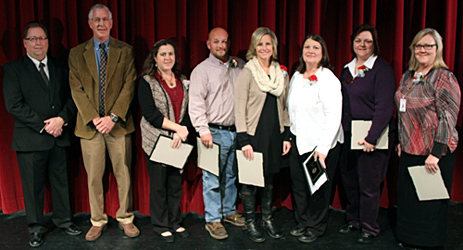 Those nominees were: Colletta McWilliams, Dewey / Garrison School; Mike Jones, Field School; Natalie Leamer, Central School / GMP; Jeanette Johnson, Chillicothe Middle School; Lisa Wilson, Chillicothe High School; and Anita Coult, Grand River Technical School. This year's award winner was Anita Coult. Coult has worked for the R-2 school system for 22 years, the past 21 years being the Basic Skills Aide at GRTS. After Douglas recognized all the Beacon Award nominees, he read the reasons Coult was nominated, as submitted by GRTS staff. "She offers help, laughter, encouragement and patience to all the GRTS staff. She is always willing to assist and is not afraid to take charge of a classroom. She is described as the GRTS duct tape, as she has 1,001 uses and fixes everything. She assists every single person at GRTS, both students and staff. She is someone you can always count on whether it be reading a test, tutoring a student or helping to process paperwork. Anita has a great relationship with students and staff, and her sense of humor is always there when you need it most. The world needs more Anita Coults,"" Douglas read. 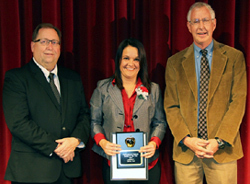 Terria Cox, third grade teacher at Field Elementary School, was named this year's Chillicothe R-2 Teacher of the Year. Cox has been teaching for 19 years, 12 being with the Chillicothe R-2 district. Douglas read what Cox's colleagues submitted on her behalf. "Terria's colleagues say she is a dedicated and professional teacher who tries to make each day full of learning activities and challenges. She knows each of her students as individuals. She always comes up with great ideas and makes learning fun for her students. Her thankful Thursdays, where students write thank you notes to those around the buildings, are treasured," Douglas read. He also mentioned Cox's Marathon Reader program where she brought people into her classroom to talk to her students about marathons. Douglas talked to her class, and he said he got to see first-hand how much she inspired children. 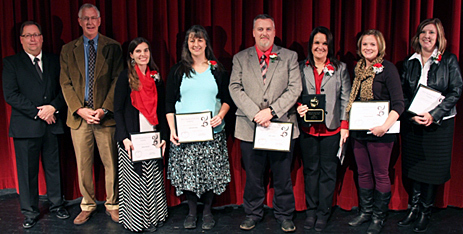 Other Teacher of the Year nominees were: Andrea Marriott, Dewey / Garrison; Deborah Hardy, Central / BMP; Billy Smith, Chillicothe Middle School; Amanda Marsh, Chillicothe High School; and Debby Peery, Grand River Technical School. "At the end of the day, the most important thing in providing a quality education is good teaching, and the teachers couldn't do it without needed support. That's what education is about. It's about how quality your staff is. You have to have good teachers, and you have to have good support staff, too, or it doesn't work," Douglas said. Douglas said the Teacher of the Year and the Beacon awards are important because it encourages excellence and gives recognition to those who reach it. The Chillicothe Education Foundation Board consists of: Ed Douglas, President; Mike Turner, Treasurer; Robin Westphal, Ad Hoc School Board Member; Dr. Roger Barnes, Superintendent; Edward P. Milbank, Director; Mary Staton, Director; Julie McCoy, Director; Lindy Chapman, Director; Inger Young, Secretary; Dr. Bruce Brodmerkle, Director; and Trent Miller, Director. 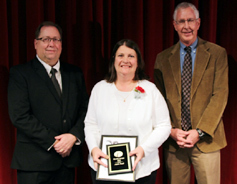 The Chillicothe Education Foundation awarded the 2014 Teacher of the Year and Beacon of the Year awards during a ceremony held Friday at the Gary Dickinson Performing Arts Center. The Teacher of the Year award was created 21 years ago to honor those educators who go above and beyond to promote educational excellence in the R-2 District. Charles Epps was the first winner of the award. Last year's recipient was Billie McGraw. Each school nominated one instructor for the Teacher of the Year award. Those nominees were: Andrea Marriott, Dewey / Garrison; Terria Cox, Field; Deborah Hardy, Central / BMP; Billy Smith, Chillicothe Middle School; Amanda Marsh, Chillicothe High School; and Debby Peery, Grand River Technical School. This year's award winner was Terria Cox. 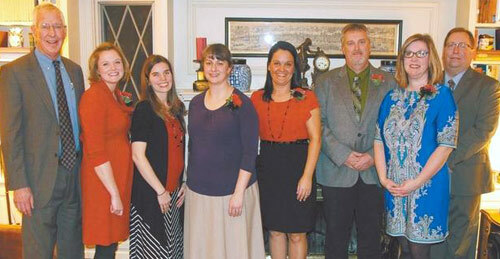 Field Elementary's nominee said she is honored to represent the Chillicothe R-2 School District as Teacher of the Year. "It's nice to be recognized for something I'm so passionate about... I work with an amazing group of educators at Field," she said. Cox said Field School is "truly a great school and is very welcoming," which not only makes it enjoyable for her to come to work every day, but students enjoy coming to school and parents enjoy being there as well, she added. 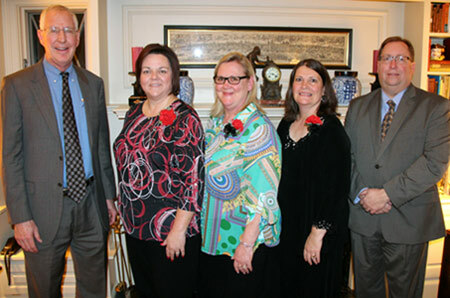 The Beacon of the Year award was created six years ago to honor the non-teaching staff throughout the R-2 district. Gary Eide was the first recipient of the award. Last year's recipient was Dave Sheler, custodian for Central School. Each school nominated one staff member for the Beacon of the Year award. Those nominees were: Colletta McWilliams, Dewey / Garrison School; Mike Jones, Field School; Natalie Leamer, Central School / GMP; Jeanette Johnson, Chillicothe Middle School; Lisa Wilson, Chillicothe High School; and Anita Coult, Grand River Technical School. This year's award winner was Anita Coult. Coult, a teacher aide at GRTS, said she was shocked to have won the award. "I have to say I work with a really good group of people," she said. "They are very helpful and I'm more than happy to help them in any way that I can. It's a great place to work and I'm honored that they chose me." Service pins were also awarded during Friday afternoon's ceremony. Those receiving 5-year pins included: Kerrie Campbell, GRTS; Sophie Chambers, Central; Andrea Dennis, CACE; Joe Hull, CMS; Katie Beth Kerr, Field; Katie Maples, Field; Heather McGraw, Field; James Ruse, Administration; Ellen Tsikoyak, CHS; Forrest Chance, Bus Barn. Those receiving 10-year pins included: Roman Cranmer, CMS; Brandi Ellis, Field; Deborah Hardy, Central; Chris Todd, GRTS; Daniel Venner, Central; Patricia Ewing, CHS; Terri May, Field; Cheryl Wood, Field. Nancy Burtch from GRTS received a 15-year pin. Those receiving 20-year pins included: Pam Miller, GRTS; Julia Reeter, Dewey; Linda Forck, Dewey; Cathy Gillespie, Dewey; Janice Hamrick, GRTS; Jeanette Johnson, CMS; Joyce Sanson, Bus Barn. Ron Rader from Field received a 30-year pin.